Have you ever felt that God was not answering your prayers or that He was silent in your life? It’s almost as if God has distanced Himself from us and we don’t feel that close to Him anymore, but if we feel far from God or God has distanced Himself from us, the question is, “Who moved?” It wasn’t God. It was us. The psalmist tells us, “Be still before the Lord and wait patiently for him” (Psalm 37:7a), because “those who wait for the Lord shall inherit the land” (Psalm 37:9b). His advice to us is to “Wait for the Lord and keep his way, and he will exalt you to inherit the land” (Psalm 37:34). For those of us who can trust the Lord enough to wait on His timing, this is not hard. It is a promise that, “none who wait for you shall be put to shame; they shall be ashamed who are wantonly treacherous” (Psalm 25:3), so, “Wait for the Lord; be strong, and let your heart take courage; wait for the Lord” (Psalm 27:14), and again he says, “Be strong, and let your heart take courage, all you who wait for the Lord” (Psalm 31:24)! I had two of my first cousins literally launch an attack on me because of my belief in God. They were angered to the point of cursing at me, asking, “Where was God when my brother was killed? Where was God when the little 10-year-old girl was raped and murdered? Where was God when those things happened? I tell them, “The same place that He was when He saw His innocent Son Jesus murdered on the cross. He has not moved.” When tragedy strikes in a school, they ask, “Where was God?” I say, “Don’t you remember? They had God kicked out of the schools, out of government, and now out of the public square, and they ask, “Where was God! ?” Finally, I say, “Okay, let’s say you are right and there is no God. You don’t believe in God, and so you say, ‘there is no God,’ but then if there is no God, guess who’s to blame? It’s mankind. Mankind has chosen to disobey God and is responsible for the suffering in the world. And, if God doesn’t exist, why do they get so angry at me (and others?). It’s because, deep down in their conscience they are convicted, and they know God exists but they are only suppressing this knowledge, so really, they have no excuse that God doesn’t exist (Rom 1:18-20). I believe that’s why non-believers get so angry about the idea of God. They love their sin and that means they won’t love God. Most people won’t deny the holocaust, but some people actually deny history, eye witnesses, and physical evidence and say the holocaust never happened. This is an intentional choice to deny the truth and they are not blinded so much as closing their eyes to the evidence. It’s not possible that the holocaust was a fabrication by the Jews who were, some say, seeking sympathy for a homeland. In other words, they want the Jews to be the victim and some even blame them for the holocaust. We know it’s a historical fact and no rational person would deny it, but the Jews cried out to God and God didn’t stop the holocaust, so where was God during the holocaust? As I said before, He was in the same place when Jesus was crucified. God has not moved. God has allowed mankind to make their own choices. Perhaps the suffering of the Jews was a way of God trying to draw them back to Him as in biblical history, God sent the Jews into captivity so that they would repent and return to Him. By the time World War II had started, the Jews were beginning to be blamed for just about everything that went wrong. They took the heat for anything bad happening, and today, the Jews are still being persecuted by the world. They are surrounded by hostile neighbors who have expressed their intent to destroy the nation of Israel. God misses nothing. He has seen all of these injustices done to the Jews, but the psalmist’s words “But for you, O Lord, do I wait; it is you, O Lord my God, who will answer” (Psalm 38:15), which is why David could write, “I waited patiently for the Lord; he inclined to me and heard my cry” (Psalm 40:1). David didn’t say how long he waited, but he did say he waited patiently for God and God heard his cries (or prayer), and God hears our cries too. When God is silent in your life, don’t think that He’s abandoned you. He has promised to never leave us or forsake us (Heb 13:5), so even if it seems God is silent, He is working things out, behind the scene, and being unseen by human eyes, He is moving, directing, and purposely planning to answer our prayers. God never wastes suffering because He might use suffering to draw us close to Him or He might use suffering to bring someone to faith in Christ, and He might even use suffering in His saints to glorify God. If we suffer well, we have a great testimony to our faith in God, and even in the storms of life, we know God is there. Just because we can’t see Him or evidence of His moving in our life, we know that He is working everything that happens to us for our own good (Rom 8:28); besides, all of this suffering won’t even be able to be compared with the glory that’s coming (Rom 8:18). We have hope in the life to come, and that should give us confidence during times of perceived silence. I have found by experience that when God is silent, God is acting. We just have to learn that God’s silence is not His answer…it is part of the answer. He may want to see if we’ll trust Him more than we trust our eyes. When God seems silent, remind yourself of His Word, which tells us, “Be still before the Lord and wait patiently for him; fret not yourself over the one who prospers in his way, over the man who carries out evil devices” (Psalm 37:7), since “those who wait for the Lord shall inherit the land” (Psalm 37:9), so God does not disappear during trials and tribulations; He is using these things to achieve a purpose in us and in the redemptive plan of God. It may be that our wait is about over, although no one knows the day or hour, but we know and have full assurance that God is going to complete what He started in us, even if it looks like He’s abandoned us altogether. Great article. Huge problem w people lost today as well is the fact that they don’t have the awareness that the Evil One is behind the scenes doing evil and is the “god of this world” (2 Corin 4:4). I’ve noticed this everywhere, mankind loves not taking responsibility for their actions. You can’t blame God, He’s perfect, righteous, good, and holy. Even back to Genesis, Adam hints that it was God’s fault that he sinned because he created Eve (Genesis 3:12). 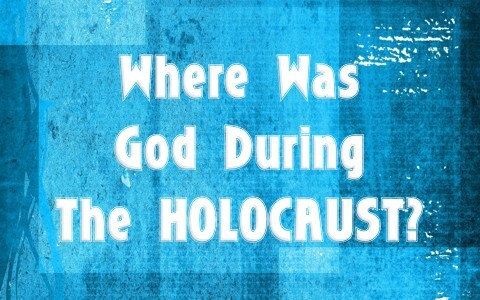 God was there during the holocaust. Nobody called Him for help. We rejected Him. Did anybody call Jesus Christ for help? My Saviour always listens to me. Next post: Should A Christian Use Force To Defend Themself?